Introduction: The role of resection of adrenal metastases (mets) in the laparoscopic (Lap) era is controversial. 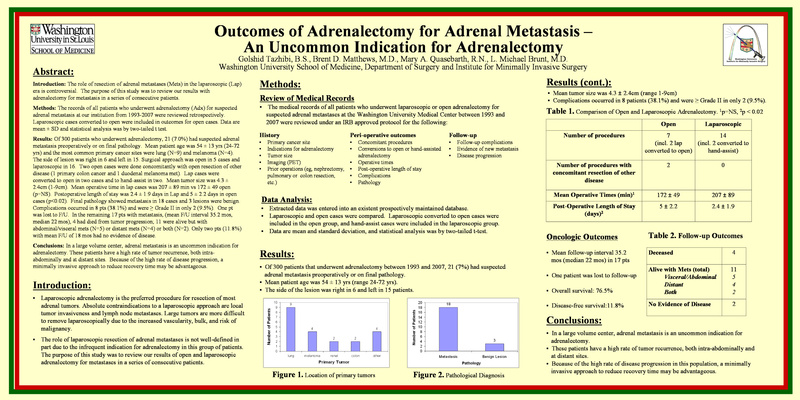 The purpose of this study was to review our results with adrenalectomy for mets in a series of consecutive patients. Methods: The records of all patients who underwent adrenalectomy for suspected adrenal metastasis at our institution from 1993-2007 were reviewed retrospectively. Lap cases converted to open were included in outcomes for open cases. Data are mean ± SD and statistical analysis was by two-tailed t test.